See below Alan Stivell’s reference to Yann Fouéré’s book ‘L’Europe aux cent drapeaux’ , which was translated into English under the title ‘Towards a Federal Europe’, and is available from the IDBE/Fondation Yann Fouéré. Someone visiting the spectacular Museum of Brittany in Rennes for the first the time would be surprised by the fact that one of the first display cases doesn’t contain a painting, a sculpture or prehistoric remains. Instead there is a record, an artefact. Specifically, it’s an LP record of Alan Stivell’s Un dewezh ‘barzh ‘gêr, a real musical gem. The fact that the museum gives the album such a prominent position is an explicit recognition of the fundamental part the artist has played in his country’s national reconstruction. After five decades of appearing on stage all round the world, Stivell is one of the great heroes of folk music, while also being a legend for those interested in New Age and techno music, since he has never stopped experimenting with musical genres. In reviving the Celtic harp, Stivell has worked closely with Breton, Scottish, Welsh, Irish and Galician musicians in the search for a common identity confined to the far side of Europe. A geographic extreme, which Stivell nevertheless turns on its head when he declares that Brittany is the centre of the known (and the unknown) universe. Stivell performed in Barcelona this New Year’s Eve, as a guest of the Galician musician Carlos Núñez, in a concert at Barcelona’s Palau de la Música. —On your new album you’ve sung in Catalan for the first time. —I’ve always shown my solidarity with other minorities, but in this case, I think that I also wanted to show that I keep abreast of current events. —Is what’s going on in Catalonia important for the Bretons? —Of course! What goes on in Catalonia and in Corsica and in Scotland. It all matters to us a lot. —Did you ever think you’d be having to speak about political prisoners and exiles in 2018? —It’s truly shocking that there are political prisoners, it makes the European Union very fragile. The existence of Catalonia’s political prisoners represents the suicide of the idea of Europe. How can the European Union ask anything of Turkey, for example, while this is going on? —What do you think the process of Catalan independence means for Europeans as a whole? —In Brittany, Yann Fouéré spoke of the Europe of a hundred flags, which is an aspiration shared by many. Europe must allow its peoples to live in freedom. And in this sense, what happens here foreshadows what might happen in other parts of Europe. —That’s right. It’s even going backwards. This is the problem with Brexit, which we Bretons see as the denial of the right of families to stay together. —It separates us from our Scottish and Welsh brothers and sisters… Up until now, the European Union allowed us to unite what London and Paris wished to separate. —You see being a Breton as a mixture of identities. —That’s right. I have French citizenship, but culturally I’m a Celt and I share my space with the Scots, the Irish and the Galicians. There’s such a thing as a citizen identity, but at the same time there’s also a cultural, national identity. My passport says I’m French, but if you ask me what I am, I’d say I’m a Celt. —What does it mean to be Breton, then? —We’re nations between borders. The Bretons and the Celts are Westerners, we are the extreme geographical West, but we’re also Eastern, since we’ve been here a long time. We’re a minority, but we’re also the last remaining Gauls. We were here before the Romans arrived on the scene. Our existence ought to be considered a cultural treasure. It turns out that we’re a nuisance because France was built on a denial of its pre-Roman past. As a result, we never manage to fit in. —Nevertheless, music has revitalized your existence, and you’ve played a big part in that. —I’ve always enjoyed research. In the Celtic world, there are many people who play folk music beautifully because it’s been handed down through their family. The grandfather played it and now the grandson does. It’s great, but sometimes it’s not enough to find out who we are. Which is why I wanted to look into our music, that of all the Celtic countries, to better understand what we are and what we can be. I’ve done some research, and I’ve looked beyond tradition, I’ve studied a lot in search of originality. —Sometimes it hasn’t helped! Some romantics have developed a very unscientific view of the Celtic world, a neo-druid view that’s almost laughable. —The language, the use of Breton, what part does it play? —Obviously it’s very important. My mother tongue is French, but I learned Breton, I had to, to do what I wanted to do. —In fact, for decades, your success has honoured the Breton language. —I can still remember really well my first concert at the Olympia, in Paris in 1972. In those days, the Bretons were seen as like peasants, people who weren’t of any interest. And suddenly there’s a Breton singing in Breton, mixing Celtic folk with rock in the temple of modern music. It also had a big impact on the language. I once performed live on a top French radio station for an audience of seven million. It must be the largest number of people to have ever heard how the Breton language sounds. —Does language define one’s world? —Every language is a world in itself. For example, in Brittany, France is called Bro-C’hall, but the word explicitly refers to the part of France that doesn’t include Brittany and, in fact, etymologically it means ‘the land of foreigners’. Which means it can’t be used to speak of a France that includes the Bretons, since we can’t use the word foreigner to refer to ourselves. That’s why Bro-Frañs was invented. In contrast, there’s no word in French or Spanish to define the nation of the French French or the Spanish Spanish. In the Iberian Peninsula, for example, what is Spanish Spain called, the part where there are no Catalans, Basques or Galicians? They don’t have a unique name for themselves. This creates a world, a way of seeing the world. They can only be understood by including us. Such things obviously have some sort of an effect! —You’ve been making music for fifty years, but you’re also politically and culturally active. How do you manage to combine the two? —I’m an activist, but the music has to be good. My political and cultural views are obvious, but if the music’s no good, then the views are worthless. In Catalonia you have some marvellous examples. Lluís Llach is a great activist, but artistically he’s what the French call a top. —Your new album, Human-Kelt, is a kind of summary of your musical career. You revisit some of your historic songs. —I’ve had plenty of time to make this album, in the studio. I’ve been able to work hard on it, and it’s been a real pleasure for me. —How’s it possible that you still find a way to make a new version of ‘Tri Martolod’? —The public have made this song their own! ‘Tri Martolod’ is a piece based on tradition which has become an anthem of sorts. On this record, I wanted to compress time. I’ve been singing it for so many years, I thought I could make a version out of the different versions. I’ve used very different arrangements in the piece: folk, electro-rock, bagad [a traditional Breton band]…, There’s even my voice from the seventies in the background, clips from the original recording. It’s as if I’d managed to do away with time by making a musical journey through my life! I like to think it’s like one of those journeys made by the Breton sailors and that I’ve been joined by all the musicians who have made the song their own so many times. —What do you feel when you hear contemporary acts such as Nolwenn Leroy, singing ‘Tri Martolod’ once again to big audiences? —It’s like listening to the original all over again. It’s like what happened in the seventies: there are people who when they hear it, they get interested in the lyrics, they discover Breton in a very positive, attractive sense. It’s great. —Speaking of politics again: the struggle for the reunification of Britany, following the division imposed by the French government, might it serve as a trigger for the Breton cause? —The fight is generating a certain awareness. They wanted to completely erase us and turn us into ‘the great west’, as they used to call us. In the end, Brittany has kept its name, but the region has lost one of its historical provinces and this has raised the awareness of many people. —For the first time there’s been talk of a referendum on reunification. —The people must have a voice. The problem is that ultimately Breton politicians depend on the political parties in Paris. —But, seen from the perspective of your five-decade long career, Brittany’s reality has changed a great deal. —Chauvinism, how do you mean? —Well, there are people who pitch ‘regions with a strong personality’, such as Britain and Corsica, against ‘regions with a weak personality’, such as Champagne and Burgundy. It’s a feeling, but without any basis in fact. —Nevertheless, it doesn’t undo all the work that’s been done all these years. —No, of course not. A lot of progress has been made. A lot. —And finally. You’ve come to Barcelona to take part in Carlos Núñez’s concert at the Palau de la Música, as his special guest. But when will we be lucky enough to see a whole Alan Stivell concert? —Oh, I don’t know! For me it’s a bit frustrating. It’s been ten years since I last played here. I’d love to come back. The IDBE team wish you a joyful Christmas and Peaceful New Year. 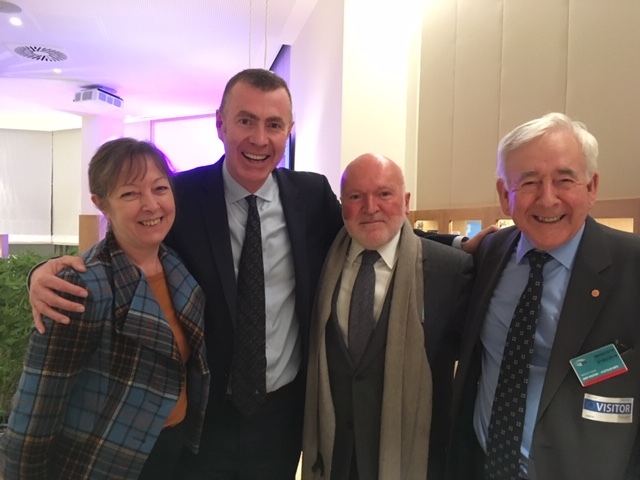 Erwan Fouéré meeting with Dafyd Wigley, Adam Price and Jill Evans MEP. Yann Fouéré’s book ‘L’Europe aux Cent Drapeaux’ presented to Président Puidgemont by Eduard Sanchez Campoy in Bruges. 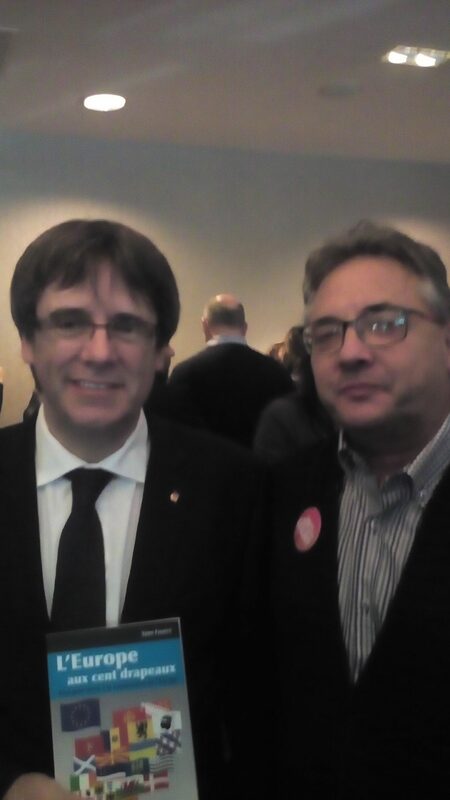 See French site for presentation by the Catalan Mayor of Calders, Eduard Sanchez Campoy at the conference. Poster and invitation with program of the Conference on 21 Octobre organised by the IDBE on ‘The role of Catalonia and other stateless nations within a Federal Europe ‘ . Ceremony of the awarding of the ‘Institut Culturel de Bretagne’ medal to the IDBE’s Digital library. On Saturday 16th September 2017, at 15 h., Centre de Congrès, 10 bd. du Général de Gaulle, 22410, Saint-Quay-Portrieux, Brittany. and to the awarding of the ‘Institut Culturel de Bretagne’ medal to the IDBE’s Digital library. Please reserve your seat with the IDBE (idbe.gwp@gmail.com). See program on the French site. Link to article on the funeral of Martin Mc Guiness. Links below to articles and interview with Olwen Fouéré on the play ‘Danse, Morob’, written by Laurent Gaudé. The play opens with the recording in 1965 of Yann Fouéré being interviewed by a Times journalist, phoning from London to the West of Ireland where telephone lines were still very poor at times…See section 4.a) ‘Audio archives’, to listen to this recording. May this new year be a successful one, with health and happiness all around, and we hope to share many important events for Brittany with you. The premises of the IDBE, situated 16, rue de la Madeleine 22200 Guingamp, will be closed on Mondays from 2nd January to 30th June 2017, but open on Saturdays from 10h00 to 16h00. The campaign for donations will continue throughout the month of January on: http://bibliotheque.idbe-bzh.org , with many thanks to all those who have already donated and to those who are about to do so!!! The team of the l’IDBE/Fonds de dotation de Bretagne wish you a happy Christmas. May it bring you warmth and joy and an opportunity to bring families and friends together. 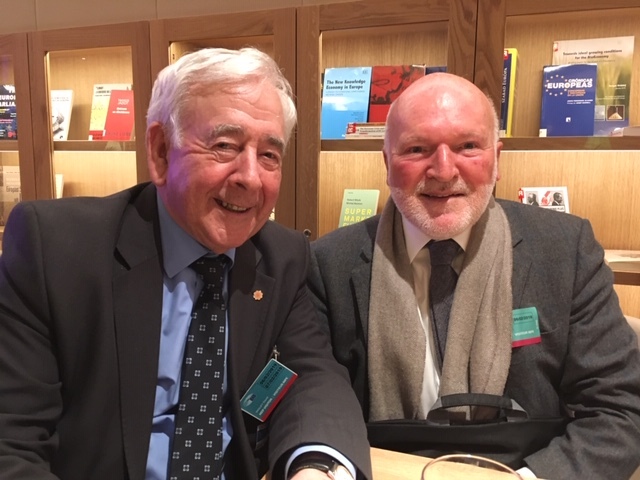 See French site for photos and reports of the Commemoration and Conference on Saturday 15 October, and also of the IDBE/Fondation Yannn Fouéré’s participation at the Carhaix Book Fair on 29th/30th October. The beloved wife of Yann Fouéré has left us for Tir na nÓg (the land of eternal youth). Marie-Magdeleine Mauger passed away on 3rd October 2016, at the age of 99 years, in the home of her son Erwan in Brussels. Her children: Rozenn, Jean-Francois, Erwan, Anne Benedicte (Benig), Olwen, their spouses, grandchildren, great grandchildren and all her family, although grieving, are celebrating the accomplishments of their parents throughout their long lives. The funeral of Marie-Magdeleine will take place on Monday 10 October at 14.30, in the Basilica of Notre Dame de Bon Secours in Guingamp ( 22 ), Brittany. The burial will take place at the La Trinity cemetery, and will be followed by a commemorative reception at the IDBE/Fondation Yann Fouéré. The planned Commemoration and Conference for Saturday 15 October will still take place in homage to both of them (see program on French site). Wales has the Daffodil, Scotland has the Thistle, Ireland has the Shamrock. And Brittany ? We do not have a plant as an emblem, yet there is no reason why we should not have one. Plants as emblems are numerous in the world. All the states of Brazil and the United States of America have theirs. Australia chose the Golden Wattle in 1988 and Quebec decided on the the Yellow Birch.in 1993. Which is why we invite you to propose a plant to become the emblem of Brittany. The IDBE has joined this campaign, which will take place from 1st May to the 30th September 2016. Roland Mogn’s idea, (see his site: plantkelt.net),is simple, consisting of choosing a plant which originates from Brittany. This project was launched by the ‘Institut Culturel de Bretagne’. The IDBE is one of the administrators, and as such it will form part of the advisory committee, and one or several plants will be considered. Pass the word around and choose just one plant name or submit a dossier. There is no shortage of plants that have been honoured in Brittany: le Bleun-Brug, the Feast of the Gorse in Pont-Aven, the Feast of Daffodils in Saint-Étienne de Montluc, the Feast of the Broom in Bannalec are some examples. The IDBE will centralise all your choices and, if a plant emerges, we will support it for the final choice. Should you prefer to do so, you can support the project on an individual, associative or professional basis and integrate the advisory committee. 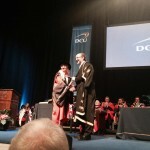 Dublin City University, Olwen Fouéré conferred Doctor of Philosophy (Honoris Causa). After ‘Arthur et David‘ in 2011 and ‘Joli mois de mai 1944′ in 2013, I am pleased to present my third book : ‘Viens rejoindre notre armée ! 1944, une Résistance bretonne à contretemps’. Always dealing with Brittany during World War II, this time according to the theme of the Breton nationalist groups, who supported in police and military operations either the Germans or the Allies at the end of the occupation, which was by far more a civil war rather than a war of liberation. Based again on the facts, testimonies and archives, while avoiding the official versions that I have no hesitation in calling into question. I will attend the Salon des écrivains bretons in Paris, Saturday 6th of February 2016 , 10-19 pm ( Salle des Fêtes de la Mairie of the 14th : 12 Castagnou Street Metro line 4 : Mouton-Duvernet station). Il will also introduce my book during a conference on Saturday 5th of March 2016 at 3:00 p.m. at the Breton cultural center, place du roy field in Guingamp. This conference is organized by the Institut de documentation bretonne et européenne (IDBE) based in Guingamp. My book will be available in bookshops and newsagents, distributed by Coop Breizh and the IDBE. Should you have any difficulty in obtaining it, I can send it to you directly: it will then also be signed! We hope that it will include many projects and get togethers. We warmly thank our members and friends for their faithful support. See the French site for details on the publication by the Fondation Yann Fouéré of the second TOME of ‘Les Saints de la Vallée’ by Sabine Daicamps. See the French site for details on the IDBE AGM on 15th May. 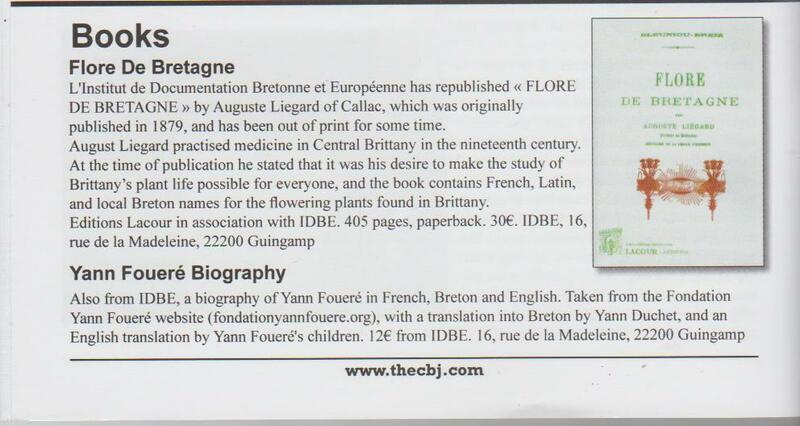 Article in the Central Brittany Journal on a new publication of ‘Flor de Bretagne’ by Dr. Auguste Liegard of Callac, and on the Official Biography of Yann Fouéré in Breton, French and English. See the French site for more details of these publications. The IDBE will be closed from Monday 29th December to 5th of January. The IDBE presents a new edition of the book ‘Flor de Bretagne’ by Auguste Liégard, which is currently impossible to buy. See French site for more details. Launching of the IDBE’s website. 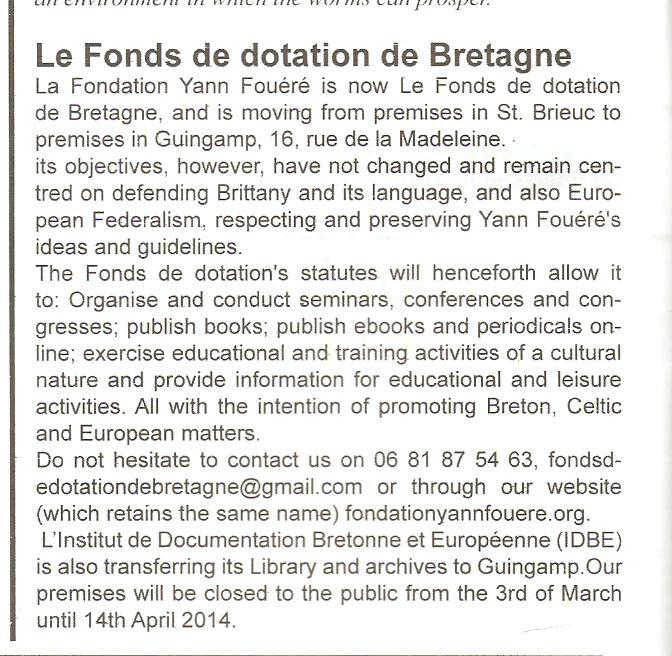 The IDBE(Institut de Documentation Bretonne et Européenne)/Fond de Dotation de Bretagne(ex. Fondation Yann Fouéré) has the pleasure of inviting you to a Dinner-Debate to be held on Saturday 17th May 2014. The reception will be from 19.00 at the ‘Manoir de Kergrec’h, 15 hent Kergrec’h, 22820 Plougrescant (8 Km. from Tréguier). 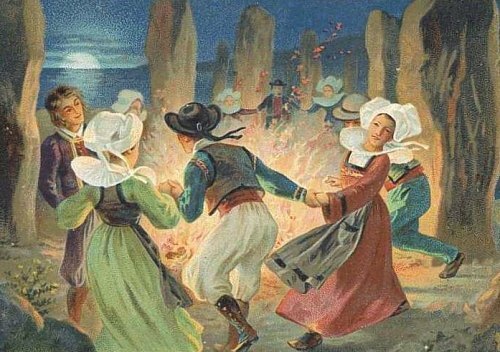 The theme will be Saint Yves, popular beliefs in Brittany within the framework of Brittany’s Feast day. This will be followed by an evening of Story telling and Song. Price for the event is €40 (€35 for paid up members). Please confirm before the 5th May (Attendance restricted to100 Places). Those wishing to overnight in order to attend the Grand Pardon de Saint Yves the following day should contact us as soon as possible. April 2014 . Communiqué in the Central Brittany Journal.